A substantial account of pulpal necrosis and resultant periapical pathosis has been attributed to the traumatic injuries inflicted to the anterior teeth among young children worldwide. Disruption of blood supply with subsequent degeneration of cells of the pulp provides an anaerobic intrapulpal environment conducive to the proliferation and growth of the opportunistic microorganisms which may later release deleterious toxins to the periapical tissues. Further, the ingress of the microorganisms and their liberated toxins and byproducts may exert an exaggerated inflammatory reaction in or near the periapical regions, inducing the formation of periapical lesions. The evidence of the presence of immunocompetent cells, as well as different mediators within the lesions, have supported to the fact that genetic susceptibility and immune-pathogenesis may also have a significant role in the development of such lesions. Until recently, surgical intervention was considered to be necessary for treating endodontic periapical lesions, particularly when they were large in size. However, advancements in scientific knowledge of the genesis, pathologic nature, and clinical behavior of endodontic periapical lesions and their successful treatment in various clinical trials have started favoring nonsurgical approach. Studies have shown that pulpo-periapical lesions have the potential for healing without surgical intervention. Different clinical studies have confirmed that nonsurgical treatment with adequate infection control can favor the healing of large periapical lesions. If the microbiological etiology is removed by nonsurgical root canal treatment, these lesions may regress by the mechanisms of apoptosis. Elimination of the microorganisms in case of large periapical lesions have been a challenge for the clinicians. Mechanical instrumentation alone is unable to completely eradicate the polymicrobial infection from the root canal system. Therefore, some form of chemical disinfection by irrigation and intracanal medicament is necessary to optimally disinfect the root canal system. Various medicaments have been advocated to help eliminate bacteria, reduce periapical inflammation, pain, and induce healing. Calcium hydroxide has been commonly used as an intracanal medicament; however, it has been reported that it is not effective in disinfecting the root canals associated with persistent endodontic infections. Various combinations of antibiotics have also been used and among them, a mixture of ciprofloxacin, metronidazole, and minocycline has shown to be very effective in eliminating endodontic pathogens. This combination is referred to as triple antibiotic paste. Ozan and Er have found that the combination of these antibiotic drugs, when used as antibacterial dressing is successful in healing large cyst-like periradicular lesions. Obtaining hermetic apical seal is one of the major technical problems. Obturation becomes difficult and is often a failure if the apex is open. Mineral trioxide aggregate (MTA) can be placed by an orthograde method with ease in such canals so as to form hermetic seal at root apex. It prevents the microleakage and also provides the benefits of inducing hard tissue formation. These case reports demonstrated resolution of periapical pathologies achieved through a nonsurgical approach, observed over a period of 12 months. Three patients with large periapical lesions and bone loss, diagnosed with chronic apical periodontitis were treated. After isolation with a rubber dam, access cavities were prepared, and removal of the necrotic pulp tissue was done after establishing the working length at 0.5–1 mm short of the radiographic apex. The canals were instrumented with # 15–40 K-files and H-files (Maillefer Instruments S.A., Ballaigues, Switzerland). Irrigation was carried out with warm 3% sodium hypochlorite solution (Vishal) which was ultrasonically activated (Irrisafe Ultrasonic Tips, Satelec) and saline. Triple antibiotic paste consisting of ciprofloxacin, metronidazole, and minocycline in 1:1:1 ratio mixed with macrogol ointment was used as an intracanal medicament for 3 weeks in each case. Sealing of the access cavity was carried out with temporary cement Cavit (3M ESPE). During the second visit, final rinse was done with 17% ethylenediaminetetraacetic acid (EDTA) solution (Prevest DenPro Ltd., Jammu, Jammu and Kashmir, India) for 1 min. The apical third of the canals were filled with MTA Plus (Prevest Denpro Ltd., Jammu, Jammu and Kashmir, India). A moist cotton pellet was placed over it, and the access cavities were sealed with cavit. The patient was recalled next day, and the remaining canals were obturated with thermoplastic Gutta-percha (E and Q Plus, Meta Biomed Co., Ltd.). Access cavities were sealed with composite resin. An 18-year-old female patient presented with pain and discolored maxillary central incisors. The patient gave the history of trauma about 10 years back. Medical history was noncontributory. Thermal and electric pulp tests were performed to determine the vitality of all the anterior teeth. Both the maxillary central incisors were found to be nonvital showing no response to thermal and electric pulp tests. Maxillary lateral incisors showed a positive response to thermal and electric pulp tests. Intraoral periapical radiograph of the involved teeth was taken which demonstrated a periapical lesion with bone loss [Figure 1]a and hence conventional root canal therapy was planned. Following isolation with rubber dam, access cavities were prepared on the maxillary central incisors and the working length determined. Canals were cleaned and shaped using K-files by a conventional method. Warm 3% sodium hypochlorite solution was used as the intracanal irrigant which was ultrasonically activated. The files were liberally coated with EDTA gel throughout instrumentation. The canals were enlarged by circumferential filling. Triple antibiotic paste was placed in the canal as intracanal medicament in each tooth and access cavities were sealed with cavit. The patient was recalled after 3 weeks. In the next visit, the canals were cleaned with warm 3% sodium hypochlorite solution and final rinses of 17% EDTA were given followed by normal saline. The canals were dried using paper points, and the apical third of the canals were obturated with MTA. A moist cotton pellet was placed over it, and the access cavities sealed with cavit [Figure 1]b. Next day, cavit was removed and the remaining canals were obturated with thermoplastic Gutta-percha [Figure 1]c. Access cavities were sealed with composite resin. The patient was recalled after 6 months [Figure 1]d and 1 year intervals [Figure 1]e. The clinical and radiographic examination demonstrated that the patient was asymptomatic, and the teeth exhibited proper integrity of the periodontal tissues after 1 year. A 49-year-old male patient reported with a painful swelling on the front right side of the upper jaw. The patient gave a history of trauma to the maxillary anterior teeth 10 years back. Intraoral examination revealed a painful swelling of the labial mucosa, adjacent to teeth 11 and 12. 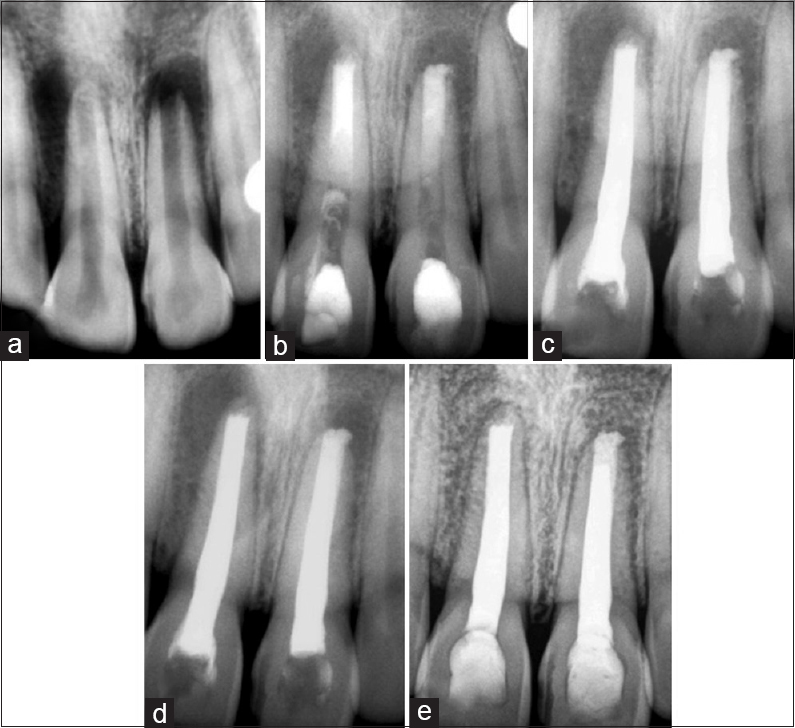 Radiographic evaluation demonstrated a large radiolucent lesion measuring approximately the size of 14 mm × 9 mm with bone loss around teeth 11 and 12 [Figure 2]a. A provisional diagnosis of chronic apical periodontitis was established. After rubber dam isolation access cavities were prepared and working length were established. The root canals were prepared using K-files until the final apical preparation sizes of #40 for teeth 11, and 12 were achieved. During the preparation, the canals were thoroughly irrigated with warm, ultrasonically activated 3% sodium hypochlorite and normal saline. Triple antibiotic paste was used as intracanal medicament for 3 weeks. The access cavities were temporarily sealed with cavit. After 3 weeks, the patient reported with the absence of pain and swelling. The canals were again copiously irrigated with warm 3% sodium hypochlorite solution followed by a final rinse of 17% EDTA and normal saline. The canals were dried, and obturation of the apical third was done with MTA. A moist cotton pellet was placed over it, and the access cavities were sealed with cavit. Next day, the remaining canals were obturated with thermoplastic Gutta-percha and access cavities were sealed with composite resin [Figure 2]b. Follow-up radiographs of 6 months [Figure 2]c and 1 year [Figure 2]d showed that the radiolucent area decreased in size, and that trabecular bone was forming. Clinical examination showed no sensitivity to percussion or palpation. A 28-year-old female patient, with no relevant medical history, presented with a painful recurrent swelling, for 1 year, on the front left side of the upper jaw. The patient gave a history of trauma to the maxillary anterior teeth 6 years back. Intraoral examination revealed a painful swelling of the palatal mucosa, adjacent to teeth 21 and 22. Radiographic evaluation demonstrated a large radiolucent lesion with bone loss around teeth 21 and 22 [Figure 2]e. Taking into account the medical and dental history of the patient, a provisional diagnosis of chronic apical periodontitis was established. Nonsurgical endodontic treatment was planned to treat the involved teeth. After rubber dam isolation access cavities were prepared and working length determined. The root canals were prepared using K-files until the final apical preparation sizes of #60 for teeth 21, and 22 were achieved. During the biomechanical preparation, the canals were thoroughly irrigated with warm, ultrasonically activated 3% sodium hypochlorite solution and normal saline. Triple antibiotic paste was used as intracanal medicament in each tooth for 3 weeks. After 3 weeks, the canals were again copiously irrigated with warm 3% sodium hypochlorite solution and final rinse of 17% EDTA solution followed by normal saline. The canals were dried with paper points, and obturation of the apical third was done with MTA. A moist cotton pellet was placed over each MTA plug, and the access cavities were sealed with cavity. Next day, the remaining canals were obturated with thermoplastic Gutta-percha [Figure 2]f. Access cavities were sealed with composite resin. During follow-up, clinical examination showed no sensitivity to percussion or palpation. Radiographic evaluation at 6 months [Figure 2]g and 1 year [Figure 2]h revealed the absence of the radiolucent area and formation of trabecular bone. The precise mechanism involved in the formation of periapical lesions is not fully understood. It is generally agreed that if the pulp becomes necrotic, its environment becomes suitable to allow microorganisms to multiply and release various toxins into the periapical tissues, initiating an inflammatory reaction, and leading to the formation of the periapical lesion. In the past, it was considered that large periapical lesions would not respond to root canal treatment alone and that surgery was always required. 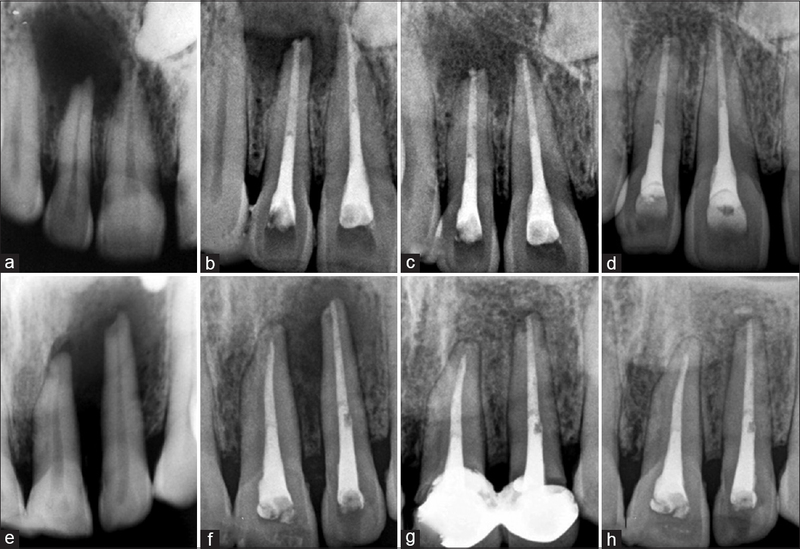 However, in recent years, there is greater awareness of the root canal morphology and the development of newer instruments, techniques, and materials has greatly enhanced the clinician's abilities. Conventional root canal treatment is aimed primarily at eliminating these bacteria. It has been proved that if the microbial load is reduced with an effective intracanal medicament, it is possible to stimulate the immunological system to induce repair, even in large lesions. Considering all this, nonsurgical root canal treatment should be considered as the first choice in cases of nonvital teeth with infected root canals. Elimination of bacteria from the root canal is the most important factor for the successful treatment of periapical lesions, and the lack of regression of such lesions is generally assigned to the persistence of bacteria inside the root canal. Irrigants and intracanal medicaments aid in reducing the microbial flora of infected root canals. The role of intracanal medicament cannot be underestimated in the eradication of the bacteria, as chemomechanical preparation alone is not enough to predictably eliminate all the bacteria. Irrigating solutions help reduce the microbial flora of the infected canals, and the use of ultrasonically activated warm 3% sodium hypochlorite can dissolve and help eliminate the necrotic tissue. Instrumentation and irrigation reduce bacterial presence. Calcium hydroxide has been considered the gold standard for optimally disinfecting root canals. However, its role in the elimination of the bacteria associated with persistent apical infections is controversial. Bacteria associated with persistent apical infections have the ability to invade the dentinal tubules and buffer the high pH produced by calcium hydroxide. The use of triple antibiotic paste consisting of ciprofloxacin, metronidazole, and minocycline, for disinfection is highly advocated. It is shown that this combination of drugs can kill any bacterium in the carious lesions, necrotic pulp, infected root dentin, and periapical lesions. Clinically, this material has been used to promote periapical healing in nonvital teeth associated with periapical lesion. The local application of antibiotics may be a more effective mode for delivery in endodontics. Even in the present cases, there were remarkable reductions in the symptoms after the use of triple antibiotic paste. The periapical lesions in the above cases were large but resolved after nonsurgical therapy. Periapical tissues have rich blood supply, lymphatic drainage, and abundant undifferentiated mesenchymal cells and therefore have good potential for healing. Thus, treatment should be directed at removing the causative factors. Triple antibiotic paste has been successfully used in the above cases to disinfect the canals and MTA used to form a three-dimensional hermetic seal at apex and also promote healing of perapical lesion. The clinical cases reported in this article showed excellent healing of large periapical lesion achieved through a nonsurgical approach. A biological rationale has been presented for the nonsurgical endodontic management of periradicular pathosis of pulpal origin. Emphasis was laid on thorough debridement, disinfection of the root canal system by triple antibiotic paste and three-dimensional obturation of the apical third of the canals with MTA. The favorable and uneventful healing of the lesions confirm that even large periapical lesions can respond favorably to nonsurgical treatment. Therefore, it must be considered as the first treatment of choice. Yanagiswa S. Pathologic study og periapical granulomas: Clinical, histopathologic and immunohistopathologic studies. J Oral Pathol 1980;9:288-300. Lin LM, Ricucci D, Lin J, Rosenberg PA. Nonsurgical root canal therapy of large cyst-like inflammatory periapical lesions and inflammatory apical cysts. J Endod 2009;35:607-15. Leonardo MR, Hernandez ME, Silva LA, Tanomaru-Filho M. Effect of a calcium hydroxide-based root canal dressing on periapical repair in dogs: A histological study. Oral Surg Oral Med Oral Pathol Oral Radiol Endod 2006;102:680-5. Ham KA, Witherspoon DE, Gutmann JL, Ravindranath S, Gait TC, Opperman LA. Preliminary evaluation of BMP-2 expression and histological characteristics during apexification with calcium hydroxide and mineral trioxide aggregate. J Endod 2005;31:275-9. Yanagisawa S. Pathologic study of periapical granulomas: Clinical, histopathologic and immunohistopathologic studies. J Oral Pathol 1980;9:288-300. Oztan MD. Endodontic treatment of teeth associated with a large periapical lesion. Int Endod J 2002;35:73-8. Portenier I, Haapasalo H, Rye A, Waltimo T, Ørstavik D, Haapasalo M. Inactivation of root canal medicaments by dentine, hydroxylapatite and bovine serum albumin. Int Endod J 2001;34:184-8. Adl A, Hamedi S, Sedigh Shams M, Motamedifar M, Sobhnamayan F. The ability of triple antibiotic paste and calcium hydroxide in disinfection of dentinal tubules. Iran Endod J 2014;9:123-6. Hoshino E, Takushige T. LSTR 3Mix-MP method – Better and efficient clinical procedures of lesion sterilization and tissue repair (LSTR) therapy. Dent Rev 1998;666:57-106. Farhad A, Mohammadi Z. Calcium hydroxide: A review. Int Dent J 2005;55:293-301. Lee SJ, Monsef M, Torabinejad M. Sealing ability of a mineral trioxide aggregate for repair of lateral root perforations. J Endod 1993;19:541-4. Torabinejad M, Watson TF, Pitt Ford TR. Sealing ability of a mineral trioxide aggregate when used as a root end filling material. J Endod 1993;19:591-5. Harty FJ. Endodontics in Clinical Practice. 2nd ed. Bristol, England: Wright; 1982. p.195.